Zion National Park provides a free shuttle ride from the Visitor Center to the Temple of Sinawava. 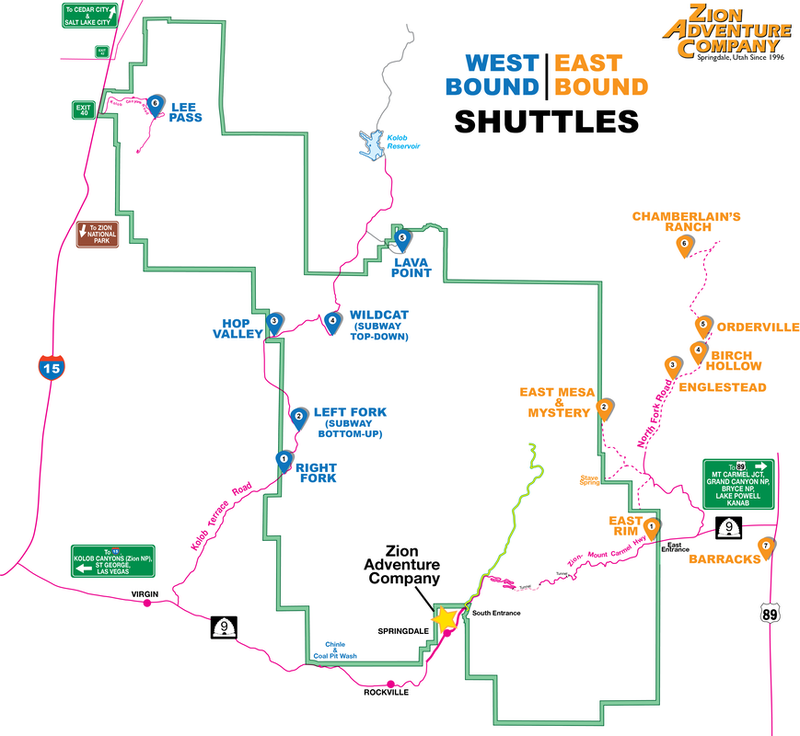 Because of the rising popularity of Zion, this shuttle schedule changes regularly. This schedule can be found HERE, on the Zion National Park Service website, but it typically begins running sometime in February and ends at the end of November. This is the primary trailhead for the Zion Narrows Top-Down Hike. The final 13 miles to Chamberlain's Ranch are on unimproved roads, and become impassable when wet. Maintained pit toilets available a trailhead. Must bring NPS park pass and Narrows Top-Down permit with you. The access road to Chamberlain's Ranch is often impassable in the winter due to snow. If this road is passable, the temperatures are often below freezing. No pit toilet access in the winter. Meet at Temple of Sinawava at least 15 minutes before departure. Maximum shuttle capacity is 14. We also offer custom pick-ups and drop-offs by customer request. We try to organize an efficient shuttle schedule, enabling the most hikers to get to their desired trailhead promptly while also minimizing shuttle prices and our carbon footprint. The time restrictions indicated in each tab help us manage this efficiency effort. Please know that exact shuttle arrival times are impossible to predict, as weather and traffic conditions, as well as customer timeliness, sometime affect our schedule. 10% for groups of 8+ paying together. Most hikers use this trailhead for hikes to Observation Point, Deertrap Mountain, and/or Cable Mountain. Most hikers visit one or more of these destinations, then continue through to Weeping Rock Trailhead, in Zion Canyon. Must have NPS park pass. 2 person minimum for shuttle to run. 10% discount for groups of 8+ paying together. Trailhead accesses Observation Point, Deertrap Mountain, and/or Cable Mountain. Meet at Weeping Rock at least 15 minutes before departure. Must bring NPS park pass . 3 person minimum for shuttle to run. This trailhead is often used for Mystery Canyon or day hiking to Observation Point (finishing in main canyon). This road becomes impassable in wet conditions. If doing Mystery Canyon, check out Tom Jones' Zion: Canyoneering book before your trip. Must have NPS park pass and permit for Mystery Canyon. $29.00/person *Includes $5 non-refundable booking fee. The trail to Mystery can be difficult to find in the winter, and is rarely done due to snow and ice within the canyon. Observation Point done as a through hike also has ice and snow often. Be sure to take some extra traction for your feet! Must bring NPS park pass and permit for Mystery Canyon. This stop is at Gifford Ranch off of the North Fork Rd., a public access jeep road parallel to Birch Hollow, 2.8 miles from Pondersosa Ranch. This is the easiest route to the head of Englestead. You have to know the route to the canyon in advance, however, as it is not obvious from the drop-off point. Check out Tom Jones' Zion: Canyoneering book before your trip. Must have NPS park pass and Orderville permit if exiting via the Narrows. Because of the difficult nature of descending a canyon in the winter, check out Tom Jones' Zion: Canyoneering book before your trip. Must bring NPS park pass & permit for Orderville permit if exiting via the Narrows. Maximum shuttle capacity is 14 people. $29.00/person *Includes $5 booking fee. This stop is at Birch Hollow, a popular Canyoneering route just off the North Fork Rd. You can finish this route out Orderville Canyon into the Narrows with a permit from Zion National Park. Check out Tom Jones' Zion: Canyoneering book before your trip. 2 person minimum for this shuttle to run. Exit via down the Narrows: Meet at Temple of Sinawava at least 15 minutes before departure. Must have NPS park pass and Orderville permit. $69.00/person *Includes $5 booking fee. Must have NPS park pass, camping reservations and permit. $69.00/person *Includes $5 non-refundable booking fee. Meet us at the East Rim Trailhead if doing the entire Trans-Zion hike. Otherwise, we can meet you in Springdale at Zion Adventure Company. Must bring NPS park pass & permits for overnight camping throughout the hike. 4 person minimum for shuttle to run.